“In proportion, then, as we prize the Gospel, let us guard the languages.” Thus wrote Martin Luther in his 1524 treatise To the Councilmen of All Cities in Germany, That They Establish and Maintain Christian Schools. It is a testimony to our love of the Gospel that we Lutherans continue to require Master of Divinity students at our seminaries to learn Hebrew and Greek. While we can certainly say, “This is the Word of the Lord” after reading an English translation in the Divine Service, nevertheless, knowledge of the biblical languages on the part of the pastor leads to richer preaching and greater clarity and delight for the congregation. With the biblical languages, the pastor is also better able to guard against false doctrine and refute it. Learning Greek and Hebrew is not a mere academic hoop through which seminarians must leap, but translates into greater care for the flock. Knowledge of the biblical languages also leads to true ecumenical discussion. A while back I had started up a biblical languages reading group with some local non-denominational clergy. Rather than having a topical discussion (in which each of us might bring out his pet verses, ignore everyone else’s pet verses, and accomplish nothing), we had an appointed reading each time we met. We would translate in advance and then talk through the text together verse by verse, commenting on vocabulary and grammar and syntax. Such a practice of starting with a set reading and paying very close attention to it led to some interesting conclusions. One time our reading group translated Romans 6:1-11, and there was a common consensus that Baptism is God’s work, not man’s. Another time, a non-denominational pastor and I translated Matthew 26:26-29, the institution of the Lord’s Supper. We agreed that the Lord’s Supper is the body and blood of Christ and gives us the forgiveness of sins. In both cases, I was blown away, because I wasn’t expecting agreement. But I suppose I shouldn’t have been surprised. We simply agreed that the Word of God says what it says. The Word of God is the only thing that can grant unity in the Church. Joint services with other confessions can’t do it, open communion can’t do it, Gospel reductionism can’t do it. We should not think of the Word of God as some sort of evil wedge that creates division in the Church. Certainly, when some hear the Word they fight against it. But this testifies to their disobedience, not to a problem with the Word. Instead, we should realize that the Word of God can create unity even where we expect disagreement and dissension. Through the Word of God, our Lord preserves his Church and brings people to the knowledge of the truth. The Word of God is, therefore, our greatest treasure on earth. 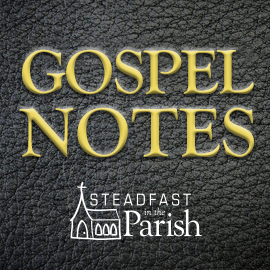 In our biblical languages reading group there was a pastor who hadn’t learned Hebrew or Greek but enjoyed sitting in and gleaning what he could. I offered to teach him Greek and ended up with another pastor in the class as well. We began Greek class in January 2018, and they had their final exam this month (November 2018). We are now beginning a Greek readings class, in which we will carefully go through various readings from the New Testament. 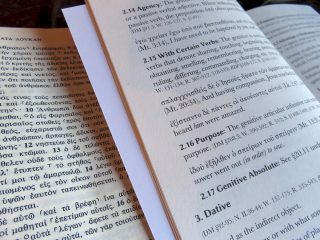 For our Greek readings class, I put together a brief book called “Overview of New Testament Greek Syntax.” It gives the meanings of the cases of nouns and of the tenses, moods, and voices of verbs. It also includes some charts that I hope will prove useful, both for those who are transitioning from grammar class into reading the New Testament and for those who have been reading Greek for some time and want to deepen their knowledge. 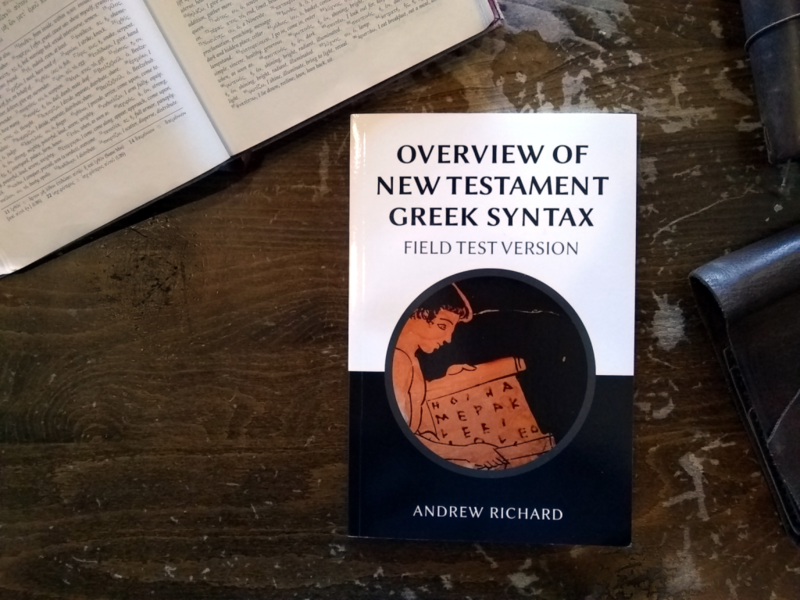 Steadfast Lutherans has published “Overview of New Testament Greek Syntax” as a field test version, to be published in final form in June 2019. During this field test period, I plan to get suggestions for improvement from the Greek readings class. But I also hope that pastors will make use of this book in its field test version and send me feedback so that I can tailor it to be as useful as possible. So, Greekies, I am asking for your help. Please look through “Overview of New Testament Greek Syntax” and tell me how to make it better. You can get a PDF of it for free here. You can purchase a hard copy for $2.69 (cost of printing) through Lulu here. Tell me what to add. Tell me what to clarify. Tell me what you had to look up most frequently when you first started reading the New Testament in Greek. You can contact me at the e-mail address given in the Introduction of the book. [T]he apostles themselves considered it necessary to put the New Testament into Greek and to bind it fast to that language, doubtless in order to preserve it for us safe and sound as in a sacred ark. For they foresaw all that was to come and now has come to pass, and knew that if it were contained only in men’s heads, wild and fearful disorder and confusion, and many various interpretations, fancies and doctrines would arise in the Church, which could be prevented and from which the plain man could be protected only by committing the New Testament to writing and language. Hence it is certain that unless the languages remain the Gospel must finally perish (Luther, ibid). Pastor Andrew Richard received his Master of Divinity from Concordia Theological Seminary in 2012, and serves St. Silas Lutheran Church, a mission congregation of Iowa District East. Pastor Richard enjoys studying the biblical languages, and language in general. He is also an avid proponent of classical education. Pastor Richard is married and has three girls and a boy. τοῦτο γάρ ἐστιν τὸ αἷμά μου τῆς διαθήκης τὸ περὶ πολλῶν ἐκχυννόμενον εἰς ἄφεσιν ἁμαρτιῶν. Thus says the Lord, and in his words are peace and joy. “Out of his inexpressible love, he has sent his own Son, Jesus Christ, into this world to take our nature upon Him, taking flesh and blood from the Virgin Mary. On Him were laid our sins and those of the whole world. He bore them for us as on the gallows of the cross He died, and on the third day he rose again, having atoned for our sin and that of our parents, again reconciling us to God the Almighty, so that we are now justified, made children of God, and will have eternal life and salvation. “That we may be sure of this and never forget His great, inexpressible love and kindness, Jesus Christ, as He was about to begin his sufferings, instituted His Supper, giving to His beloved disciples His own body to eat and His blood to drink, and said to them – and to all Christians – that it is His body given for them and His blood shed for them, for the forgiveness of sins, and that as often as they eat and drink of it, they should do so for His remembrance and, as St. Paul says, to proclaim His death until He comes again on the Last Day as judge of the living and the dead. 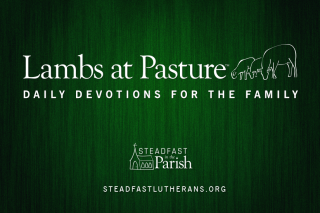 Dear readers of Steadfast Lutherans. After discussing this with the editors and authors at Steadfast who have been and are affected by the comments, it is our decision to no longer allow comments to be posted by George Marquart. Instantly connect with tested foundations.